I’ve been looking at wedding cakes so long that I’m sick of looking at wedding cakes. Jim and I have a hard time agreeing on what we’d want. The cupcake idea was always cute and pretty cheap from what i hear. And btw wedding cakes can be ridiculously expensive if you haven’t priced them yet. 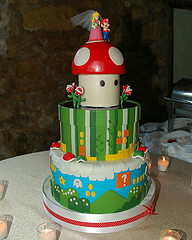 I agree with Jim, though i’m an avid fan of Mario, having a cake themed after it, with princess peach to top it off is really too much!